Located on Marconi Ave between Norris Ave and Eastern Ave, Extra Space Storage serves Sacramento residents near Arden-Arcade, Carmichael, Rancho Cordova, East Sacramento, Del Paso Heights, and more. Locals will recognize our facility next to McDonald's. Extra Space Storage on Marconi Ave offers a variety of storage units, exceptional security, climate-controlled storage, and vehicle storage. We're the partner you can trust in Sacramento near Arden-Arcade! With everything from small storage lockers up to large 10x30 units, we have the perfect storage option for your unique needs. We also have units with first-floor access, elevator access, and drive-up access. At Extra Space Storage, we care about the safety of our customers and their stored belongings. 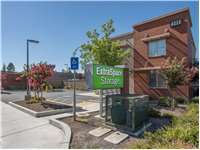 That's why our Sacramento storage facility utilizes security features like an on-site resident manager, 24-hour video surveillance, individually-alarmed units, and electronic gate access. Concerned about storing delicate items in self storage? Keep them safe from extreme heat and cold in a climate-controlled unit. Climate control maintains temperatures between 55 and 80 degrees year-round. Looking for secure vehicle storage in Sacramento? Extra Space Storage on Marconi Ave has large outdoor parking spaces and enclosed drive-up units that can accommodate motorcycles, cars, boats, and RVs. At Extra Space Storage, we believe our customers deserve the best. That's why we offer secure, high-quality self storage units at affordable rates, with the excellent service you expect from our team. Our well-maintained facility is always clean and welcoming, and our team is standing by to make sure you are satisfied with your storage solution. Contact us today to reserve a storage unit in Sacramento! Marconi & Norris. Very close to Marconi & Eastern. Drive south on Eastern Ave. Turn right onto Marconi Ave. Our facility will be on your right after McDonald's. Drive north on Eastern Ave. Turn left onto Marconi Ave. Our facility will be on your right after McDonald's. Drive west on Marconi Ave. Pass Eastern Ave and continue west. Our facility will be on your right after McDonald's. Drive east on Marconi Ave. Pass Watt Ave and continue east. Our facility will be on your left after Norris Ave.